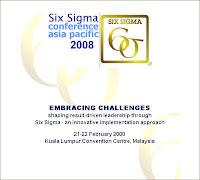 On Feb 21st and 22nd this year (2008), the annual Asia Pacific Six Sigma Conference was held at Kuala Lumpur, Malaysia. 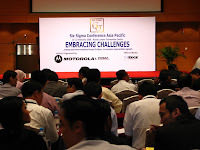 I had the honour of being a guest speaker, and was able to offer 'best in class' case studies where we have applied 'Lean Thinking' and DSS methodologies in business (non-manufacturing) processes. DSS and Lean are very powerful for any organization in today's business environment, and by utilizing the appropriate tools we are achieving millions of dollars of savings across our organization and businesses. The following is the official Motorola press announcement after the event. 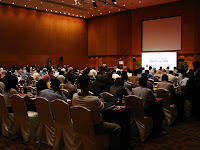 Following below this, are various links relating to the conference, including the official content brochure and presentation materials of the speakers. 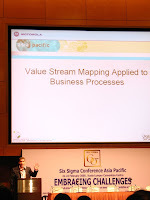 I've been trained in six sigma and we will roll it out in our company soon. Amazing methodologies.